Last time I ventured so far into the North West Highlands was in the height of Summer. Blue skies never ceased, the temperature soared and without a breath of wind to create even a little bit of drama, I'm sorry to say I left a little disappointed. 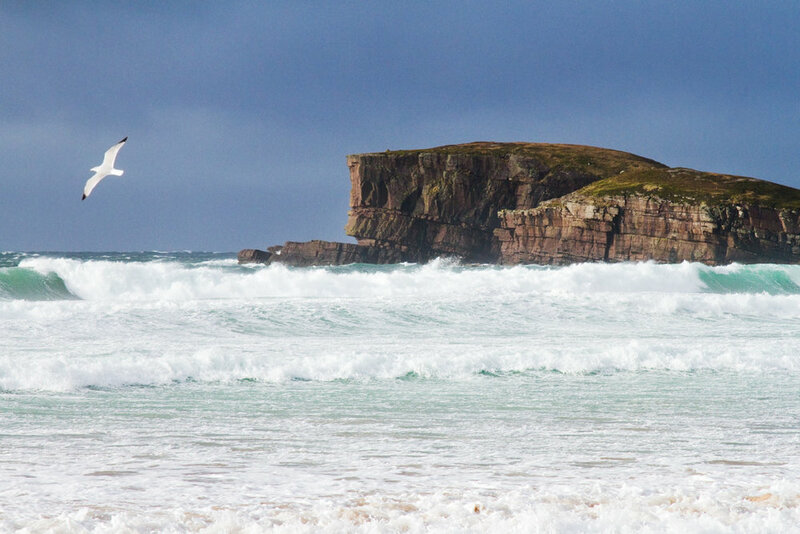 Last week however, I returned to Sutherland and discovered Scotland's very own Wild West. I knew this trip would bring a sense of exploring the unchartered, and so I wanted to approach this project with as few preconceived ideas as possible. Beyond sunrise and sunset times, weather forecasts and tide times I did little to no research for this trip, which is why I thought it best to employ some local knowledge. A friend of mine, Nathan, grew up in Kinlochbervie from where he recounts stories of climbs with his dad and camps with his brother. I thought it was about time to slyly instigate an invitation and enjoy the benefits of a local guide. After arriving at our digs at midnight the night before, first stop on my tour of the Sutherland coast was Oldshoremore beach - a typical, albeit modest, stretch of stunning Scottish sand. The scene was filled with enormous breakers rolling in off the Atlantic and was topped off by the striking outcrop of rock rising out of the ocean. This would call for a return at sunset. We spent the day exploring the hills over the beach and being battered by the wind. It's been a long time since rain has stung my face. Needless to say that when it was time to venture out for a sunset shoot and the wind had considerably subsided it was a great relief. Day two began wet and wild with a wander down to the bottom of the croft we were staying. A short jaunt up the adjacent hill lead to a cracking view up the loch to some of the peaks on the horizon. I found a cool composition but the low cloud prevented me from getting a decent shot. I gave up when the hail arrived. Later that afternoon however couldn't have been further from my morning experience. Nathan and I decided to walk round the coast to Sheigra. The views round the coastline were stunning and was littered with amazing cliffs and rock formations. As we rounded the headland and I got my first glimpse of Sheigra, the cloud broke up, the golden strip shone in the sunlight and the blue waters glistened as they crashed onto the shore. When we reached the tide line I found the large rocks contrasting with the soft golden sand a really interesting juxtaposition. Following a walk up the peat road and cross country to find a waterfall and some pretty awesome sea cliffs we rewarded ourselves with the best hot chocolate in the world at Cocoa Mountain in the Balnakeil Craft Village near Durness. On the way back to Kinlochbervie we stopped off at the Kyle of Durness Estuary with the hope of some evening light on Beinn Spionnaidh and Cranstackie. 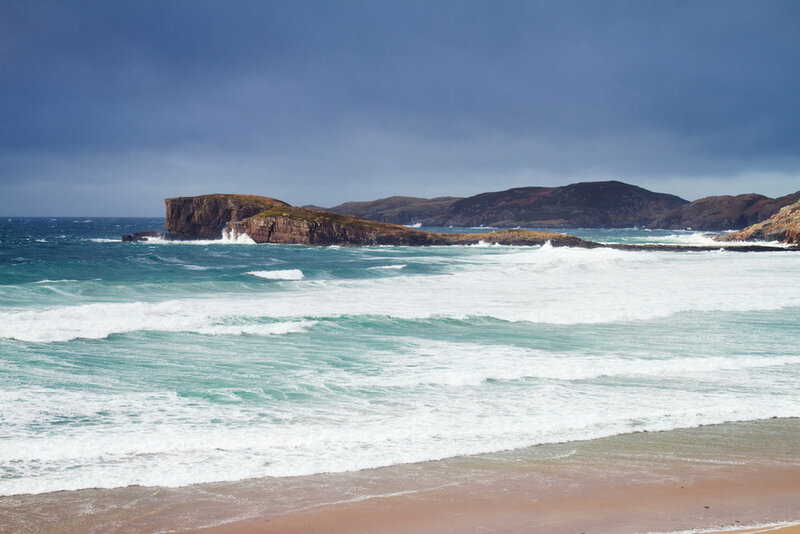 Our last day we spent visiting the daddy of Sutherland beaches - Sandwood. This isolated beach is at the end of a four and a half mile walk and although my blistered feet were screaming by the end, every step was worth it. The mile and a half stretch of pure seclusion, had so much to offer. 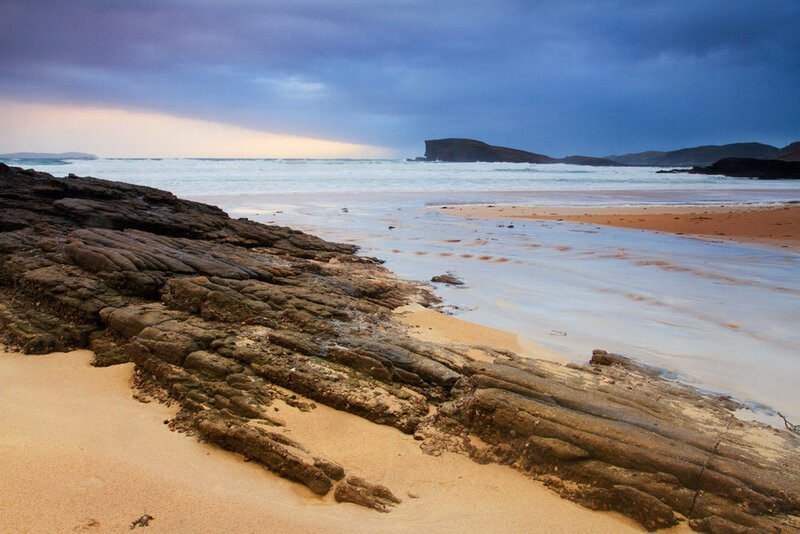 What strikes you first in the sheer vastness of blue sea and golden sand - another gem of the Scottish coast line. As you approach you begin to get lost in the seemingly endless dunes before emerging out onto the beach where it finally gives up it's crown jewel - Am Buachaille. What perhaps struck me the most was the view looking North. During momentary breaks in the weather it was possible to see all the way to the Cape Wrath lighthouse - the most North-Westerly point of the British mainland. On our final morning I had to make the hard decision of which sunrise location to shoot. So far a sunrise had eluded me and I wanted to make the most of my last chance. I decided on a cliff top viewpoint looking across the sea to the peaks of Foinaven, Arkle and Ben Stack. With barely a minute to spare, I battled against the wind coming in off the sea to set up my camera and tripod looking down onto the rocks below as the swell surged over them. The glow to the East that I had been watching from the car as we raced towards my location of choice was intensifying by the second and I managed to catch this shot before the sun rose into the cloud about the summits.